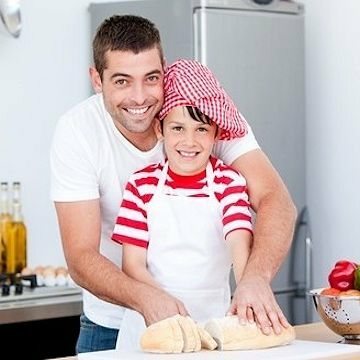 Send�your dad a gourmet meal! Send your deserving dad a dinner for two or four. Tell your dad how much you care and respect him with this dinner voucher. Your gift recipient will receive an elegant voucher and a list of dinner menus to choose from. Your recipient will be able to order from a Boneless Pork Chop Meal, Chicken Cordon Bleu, Classic Sunday Pot Roast and more (each meal comes with two vegetable side dishes). That's just the beginning. When they redeem their voucher, we will also include a choice of beautifully prepared desserts to complete their wonderful meal. The packet includes instructions on how to redeem their meal voucher. The voucher comes with ten menu items to choose from. Each meal includes entree, side and choice of dessert. The price is all inclusive so your recipient does not have to pay additional charges. Shipping Information: The cut off for same day shipping or same day email delivery on this item is 1:00pm CST. Meal vouchers are mailed via USPS or emailed on the date received if received before 1:00 PM CST Monday through Friday. If meal voucher orders are received on the weekend, they will be mailed or emailed the following Monday. If you wish for a voucher to be received by mail on a specific date, please type a SPECIAL DELIVERY DATE in the box below and select overnight delivery. There will be an additional $35.99 charge for overnight or special delivery meal vouchers, and $49.99 for Saturday delivery. *Same day delivery applies only to email delivery of voucher. *No Saturday or Sunday deliveries available. *Vouchers may not be redeemed for cash. *Vouchers expire one year from the date of issuance. *Once redeemed, meals ship with ground shipping and deliver according to selected delivery date.